MALBA and il Museo Nacional de Bellas Artes. There is a convienent little publication in Carlos’ appartment, a pocket-sized guide called the Mapa de Artes Buenos Aires. From its pages I select two museums I must visit. The first is a MALPA; (or Museo de Art Latinamericano de Buenos Aires for short) is a private museum, constructed by property tycoon Eduardo Constantini to display his huge collection of modern and contemporary Latin American Art.. When I arrive it turns out to be a distinctive modern building over three floors. Thethird floor houses the permanent displays, while the first and second floors are used to display large temporary exhibitions. 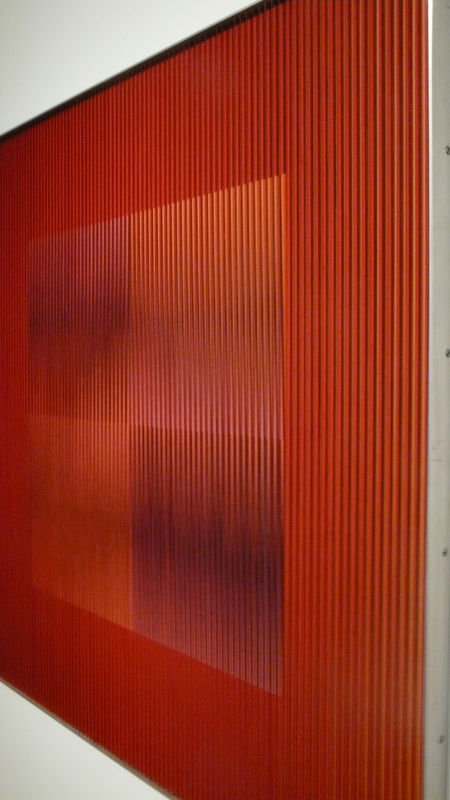 One current show is a retrospective dedicated to Carlos Cruz-Diez. 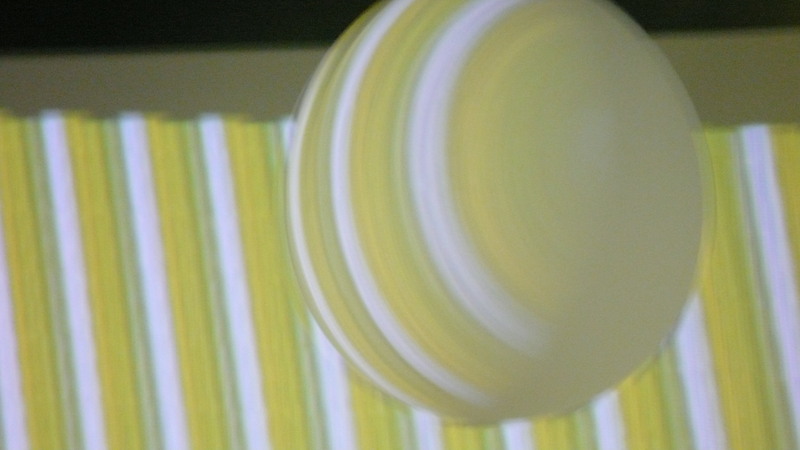 a painter who worked in the “style” generally known as Op Art. Accordingly his work plays with lines and shapes, configuring them in ways that shift and change as we view them and, in doing so, it asks interesting questions about vision and perception. 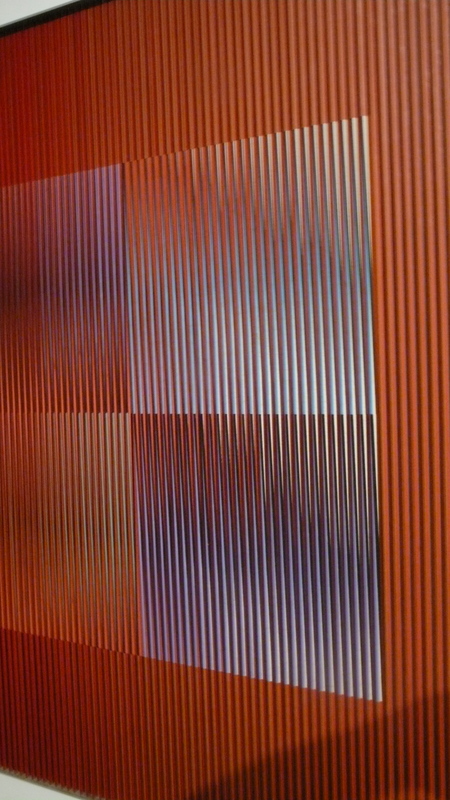 Cruz-Diez had his own highly distictive style of, and contribution to, Op Art. Essentially he carefully constructed and painted multi-surface squares. Each such work consists of ridges of parralell bands, and each band is painted a different colour on each side of the ridge, sometimes on the front end of the ridge, and in the spaces between the ridges. The effect, in the gallery is of visitors twisting, craning, bobbing and shifting in front of each work, in order to sample the full benefits A sort of pilates then for art lovers. The effect of the works is curious, beautiful and thought provoking. Cruz-Diez also made light installations with moving bands of colour, as well as large scale sculptures and proposals for large works and art installations using his own special artistic idiom, including works to be painted on the sides of large ships and airliners. 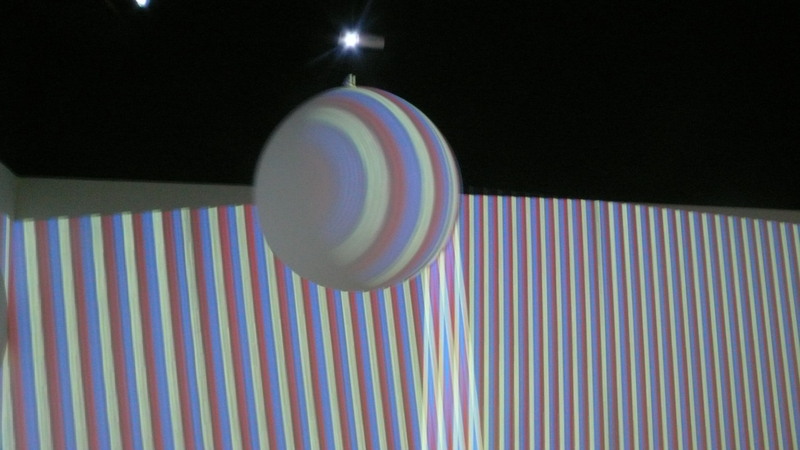 The light installations of Cruz-Diez remind me of other wonderful work, by one of the artists I revere most in the world, – the US Quaker, landscape and light artist James Turrell. Turrell has a entire building dedicated to his work in Argentina, with a whole series of his extraordinary large scale installations. Unfortunately it is far to the North-West of here, away in distant Salta, an airplane flight or gruelling 20-plus hours bus ride away. I’m sad I almost certainly won’t see the Turrell installations, at least not on this trip. I may visit Tigre or Colonia, but it’s unlikely I’ll be undertaking any long range 4 or five day journeys in my remaining time here. I enjoy and feel settled here in Buenos Aires, even with my tiny handful of acquaintances, and travelling is less ecconomical and more demanding done solo. 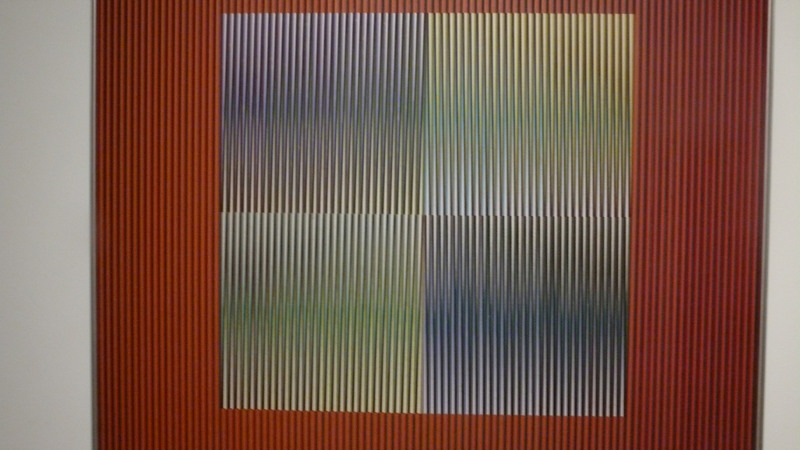 The works of Cruz-Diez in MALBA provide some consolation. They really are very lovely. 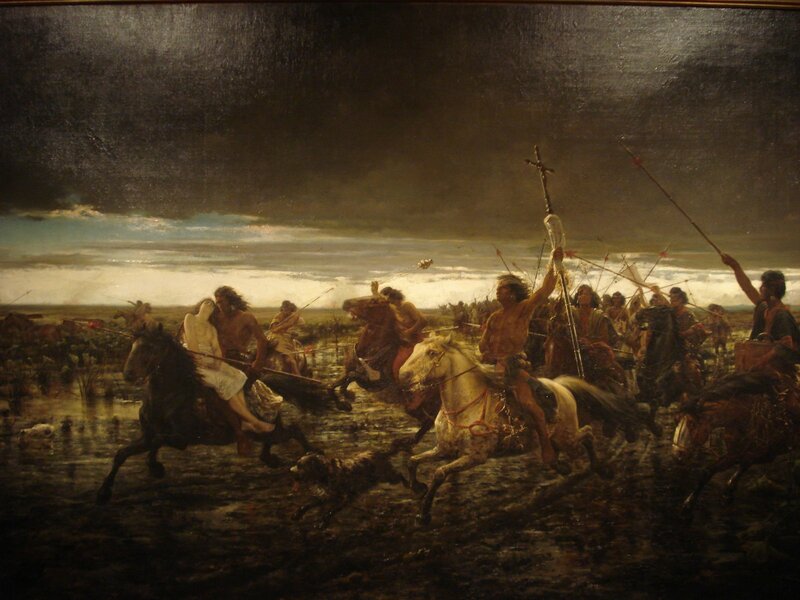 My next museum excursion comes a few days later, to the Museo Nacional de Bellas Artes. This institution, with its neo-classical façade on Avenida Liberator is a far more traditional museum than MALBA. About half the works inside are European, brought back by wealthy Argentine collectors over the last hundred and fifty years. These include some brilliant but harrowing pieces by Goya, both prints and paintings, from his horrors of War series. There are also French paintings, (I spot Degas and others) and even works from the Renaissance to the Seventeenth century. The Renaissance works are not from the marque names one sees in the Uffici or the Lourve, there are no Leonardos, Michelanglos or Raphaels, all these being both unobtainably rare and simply not- available-for-purchase any time in the last few centuries. But the works here were still well chosen by their orginal purchasers and donors and are are excellent quality. Nonetheless, what I find more interesting, than all the European Art, is the Argentine Art on show. It falls into several catagories. Many works are by Argentine painters or sculptors who during their time, either retained or else fully asimilated contemporary developments in Europe. Portraits of members of Buenos Aires wealthy Society are painted in a manner identical to their 19th century Paris contemporaries. Another category, which I find far more interesting is work by artists who either failed to or else choose not to asimilate European styles. 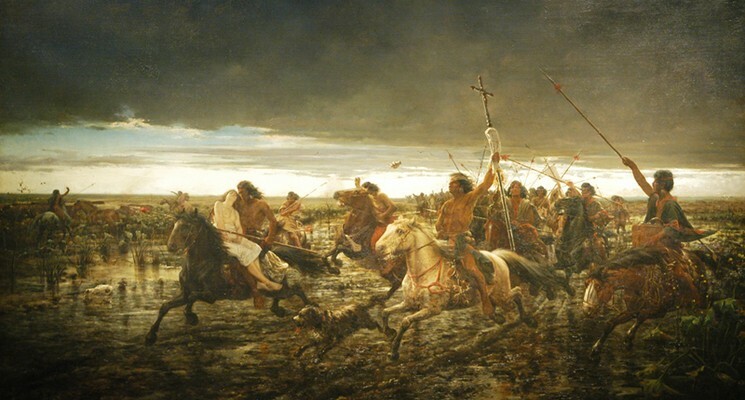 There is, for example, a whole series, a cycle, of paintings by one Cándido López, illustating a sequence of military events from Argentine history. They are large in format, the view-point slightly distant to allow a panaramaic views. Figures, almost all soldiers, are small, no more than a finger high, and often far smaller. One picture, titled Vista Interior de Curuzú is relatively calm. It shows a large encampments. Soldiers go about their various tasks, walking among the lafge tents, chopping wood and hauling sacks of supplies. Ships are moored off-shore. Most of the other paintings in the series show battles. One in particular is horrific. It illustrates not the battle itself but the immediate aftermath, the “mopping up” stage. Many of the dead have been stipped of their clothes. Some are missing heads or limbs. They lie still and naked in the dirt and grass. There is blood, and cold, savage cruelty everywhere. Injured surrvivors are finished off with a shot to the heart or head, as they lie helpless on the ground. At least twice López paints the flash of a musket, dircted straight at a helpless victim, despite an imploring outstretched arm. Even at a panaromic distance, this is pretty nasty. There are a few shallow, reed fringed ponds on the battle field. For some reason one victorious soldier is dragging a corpse through the shallows, leaving a cloudy trail of blood through the water. López is not the most technically acomplished artist I’ve encountered, although he shows an excellent grasp of scale and compoition, and a brilliant sense for the telling detail. But he may be one of the most powerful, the most moving. In any case, even had he had the technique, impressing people with mastery was not his priority, or at least not his true calling. These are pictures that illustrate the building of a nation, by someone who appears to have been a first-hand eye wittness. French artsitic polish is not only irrelevant; given the subject matter, it might even be a little obscene. One wonders what López’s private feelings were, about the butchery on the battlefield. These documents seem to fufill some sort of narrative function, presumably for the victors. Yet at the same time, they hardly look like a peon of glorification. Having said all of the above, about subject versus technique I mean, there is one nineteenth century work in the Bellas Artes, by an Argentine painter, that rocks me back on my heels, being both dramatic in conception and brilliantly executed. It is a work by Angel Della Valle called La Vuelta del Malon. This roughly translates as, and indeed depicts, “the return of the Indian Raid” . Yes, Indian braves are galloping at dusk, flying headlong through the fields and marshes. Their mongrel hounds fly alongside them. 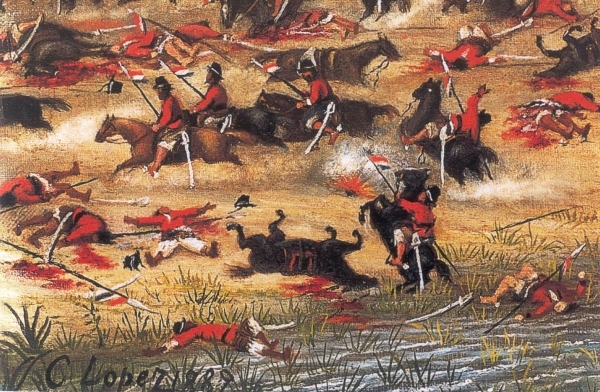 The horses, ridden hard, are splatterted with mud and blood, flecked with sweat and foaming at the mouth. She has already been stripped to the waist and sits side saddle, held out in front by a particularly-savage and lavivious looking Indian. She appears to have already fainted. Or perhaps she has closed her eyes in silent prayer. The whole thing is, of course, the most amazing piece of propadanda, and a ludricrous example of self-justifying racist kitch. But damm, is it well painted. The artist could hardly have chosen a more difficult set of objects. Galloping horses are notoriously hard to paint accurately, (European artists made an absolutes heines of them, for centuries) and just to show off completely, this artist, Della Valle, has even very, very slightly, forshortened the horses and dogs in perspective. Not to mention the general sense of forward rushing dynamism; the low crepuscular lighting, and so on. Della Valle uses the ground brilliantly to convey the sense of speed and savage excitement. Outrageous kitch or not, the whole ensemble is handled brilliantly. March 1, 2012 December 7, 2013 Arran HendersonArts and Artists, Buenos Aires, History, Travel Writing. Next Post “Money Can’t Buy you Love” … How the West was Lost.